The instrument base includes all items required for operation. A high quality hand pump is coupled to a 7 to 1 intensifier, allowing the operator to easily generate high pressure in the system. An oil reservoir is included so the pump to be re-charged when calibrating large volume devices. A test station is provided for connecting the device under test to the P3800 Series. Adjustable feet and the level vial allow the operator to insure the instrument is level to achieve the ultimate performance. A piston float reference allows the operator to determine when the piston is in the ideal, “mid float” position. The piston/cylinder is the “heart” of the deadweight tester. P3800 Series pistons are manufactured from tungsten carbide, which provides excellent long term stability, durability, and extremely low coefficients for temperature and pressure. Standard weight masses are series 3 non-magnetic stainless steel. 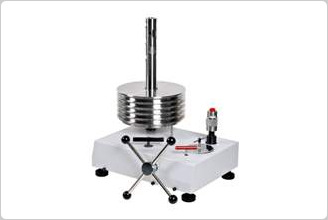 Each mass is marked with the serial number of the instrument and the nominal pressure value. Select either PSI, bar kgf/cm2 or MPa pressure units. Presscal software can be used to support additional pressure units. Gravity varies significantly with geographical locations. 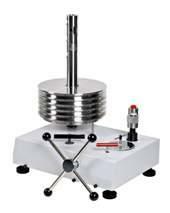 Each instrument can be calibrated to local gravity a no additional cost. If unspecified, instruments are calibrated to standard gravity at 980.665 cm/s2. Accuracy* Standard accuracy is 0.02% of Reading*. Optional accuracy of 0.015% of Reading is available. ISO/IEC 17025 accredited calibration is provided with each instrument. *Accuracy is based on % of Reading from 10% to 100% of the piston range when used in accordance with the corrections found on the calibration certificate. Below 10%, ± (accuracy class) x 10% of the piston range. See the “Guide for the Uncertainty Analysis in Pressure when Using P3000 Series Deadweight Testers” technical note for more information. Presscal software Windows based software program that allows users to easily apply all necessary corrections to enhance the deadweight tester performance. Supports additional 12 pressure units (bar, mbar, MPa, kPa, psi, kg/cm2, atm, in H2O, mH2O, mmH2O, inHg, mmHg). For applications that require nominal pressure increments in measurement units different than the main unit, conversion weight sets are available.